This addon lets you easily make sets of gear of yourself, or other players, at any quality! You can even access the UI from anywhere, so you'll never have to worry about forgetting an order again! Once added to the queue, the addon will also tell you how many materials are required. Once you've added a piece to the crafting queue, the addon will craft it when you arrive at a station where it can do so, assuming you have the knowledge and materials to make it. Note: If you only see helms, please logout and login to fix it. Textures require a full restart of the game to show up. Thanks to all the beta testers who helped out, as well as @xpleader, @PaigeEvenstar, @HappyElephant and Memoraike who helped with translations. Allergy Warning: This addon may contain eggs, especially on Easter and other holidays. Changelog to come later when I have the time. Fixed a bug where items would not be improved when auto craft was not selected. Fixed a bug where you would be unable to send mails of material requirements. Fixed a bug where Jewelry would use two green improvement mats instead of one. This only affected green quality. The Multiplier box will now save its text, and won't put that text into the level box. The multiplier now has a minimum of 1, and if you do a decimal number it will use the floor of it. Added an Auto Craft toggle button. Defaults to ON. If ON the addon will behave in the same way it previously did. If OFF, the addon will not automatically craft items when you interact with a station. Instead, a button will appear which will have the addon begin to craft when pressed. If you exit the station, the addon will stop crafting and will not continue crafting until you reenter. Added a Mimic Stone toggle. Defaults to OFF. If ON, any items added to the queue will use a Crown Stone. WARNING: If you turn the toggle off, they will still continue to use a Crown Stone! If an item requires a Crown Stone, the text in the queue will be yellow, and mousing over it will bring up a tooltip notifying you that it will use a Mimic Stone. These toggle buttons can be found in the top left of the window. The window will remember its last size. The toggle button will now remember where you last put it. Removed Universal from the style list. Rewrote the Pattern buttons and the AddToQueue functions to make them more streamlined. Added a Multicraft feature! If you type a number in the multipler box, it will add that many copies of the item to the queue when you click Add To Queue! Feedback window changed to match Writ Crafter feedback window. It also now fully shows up on the EU server. Gold sent on EU will be passed along to other addon authors. A large amount of French and German translations have been added. Most strings, if not all of them, should be translated. If you come across any which are not, let me know. Redid how the addon compiles Material Requirements. This will fix a bug which occurred when adding non white quality items to the queue. Added divider.lua and 100023 to the .txt file. Added a toggle button for the UI. You can go into the settigns menu to have the button show up all the time, but it will always show up when you are at a crafting station. Removed an empty table in the language files. Settings have been wiped. In return, there is now a simple saved variables profiling. By default, all settings are account wide, however you can choose any number of characters to have a character specific saved variable profile. Some settings are always account wide. The materials list will now have a red background when you do not have enough mats, rather than a tooltip. Instead, there will now be a tooltip showing the item. Fixed a bug where shields were requiring a weapon trait to be selected - they were still being crafted with the correct armour trait though. Added the ability to mail crafting requirements to players. Added output to show the current total of mats, as well as red highlighting if the user does not have enough. Also shows a tooltip when hovering over it with the mouse. Changed the size of the material scroll list slightly to accommodate new buttons, and set mouseEnabled=false. Removed the debugFunctions call - with the saved choices it is not really required anymore. Added a valid level prompt, which will notify you if an invalid level is selected. LLC update - should increase accuracy as well as backwards compatibility. Added saving of the last selected options. Does not save the patterns, only attributes. Toggleable in the settings menu. Fixed a bug where the materials for medium armour would say they needed light armour materials. Fixed a bug where adding multiple items at one time to the set crafter while at a station would cause one item to be crafted twice and another not crafted at all. Addon will now remove the initial crafting mats from the mat list as the white normal item is created, leaving behind the improvement mats. Quality colours now use the vanilla game colours. non CP items will again be crafted. Fixed a bug where creating multiple items with green or higher quality would cause some white items to be made too many times. Fixed a bug where the wrong improvement mat requirements would be given. Fixed a bug where sometimes the wrong ability would be checked when determining the improvement skill level. Added a Materials Total! Now you can see how much mats it will cost to make items in the queue. Added an error message if you do not have any pieces selected. Moved all virtual templates to their own file - there's quite a few now. Fixed a bug where clothing items were using incorrect trait knowledge. Possibly fixed the double crafting issue. Added the images back in. Added a potential fix to the rare double crafting bug. Fixed the trait knowledge checking. Trait knowledge should be correctly highlighted both for single traits and sets. Fixed a bug where the addon would ask you to select an armour trait when only creating weapons. Fixed the Lua error on login. Fixed a bug that prevented the addon from making non set items. Fixed a bug where shields were using Weapon traits instead of Armour traits. This resulted in the addon not crafting, unless No Trait was selected, as well as the addon requiring you to select a weapon trait. Added an error message when the user does not select all attributes. You can neglect to select a weapon trait if no weapons are requested, and the same for armour. Some styles and Set names have acquired shorter versions, mainly for English. If you have an issue with any on German or French, let me know, with a short version and I will likely add it in. Styles that you do not know are greyed out in the queue. You can still select it for an item, though it won't be crafted. If you change to a toon that does know it, it will no longer be greyed out, and vice verse. Items in the queue will now no longer run into each other. Some sets and styles have received shortened names. Changed the layout a little bit again. The queue is also now part of the main window, instead of being a seperate window. Wooden Weapons should now craft properly. Not sure where this add-on is getting price information, since i'm not in a trade guild, I am using Tamriel Trade Centre. Are there any plans for an enchant module? 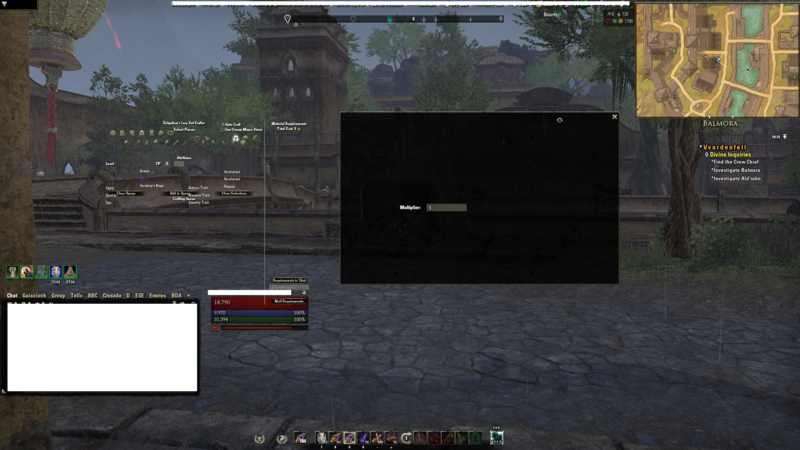 I've been having an issue with the "background" of the addon window off to the side of the actual window. When I click on the actual window the background pops back into place. Purely a cosmetic issue. I love the functionality of the addon! We spoke briefly in game about this and you suggested that UI scaling could be the cause of the issue. I have UI scaling all the way to the left in the settings. Thanks again! 1. Please add the ability to save / load the creation Queue to be able to quickly load the finished Queue. 2. It would also be great if you could edit The parts in the creation Queue - level, style, trait and so on. I definitely second these suggestions. Would be nice to be able to save queues and then adjust the level for when we want to make sets for a character we're leveling. As it stands, we just have to make an entirely new queue each time. Has this AddOn now been discontinued? If it has, I'll be very very sad - it's truly one of the great AddOns. I hope this doesn't mean Dolgubon is leaving ESO, because their AddOns have brought so much to the game for PC players. Uh... what? How did you get that idea? The addon is not discontinued, nor do I plan to discontinue it. Last edited by Weolo : 04/06/19 at 03:27 PM. Are you getting this error every time, or was it a one time thing? I got the following error today when I went to use the addon to craft some gear for a friend. For those asking about a favourites feature: It is planned, but it will probably be some time before it is added. hello I have come to fall in love with this addon, have made so many items with it. Now I have begin wanting for a feature to save presets for sets or favorite item saving that I am making many times, both for my own characters and friends/guildies. Is there any plans to implement presets or favorite saving in the future? 3. And it would be nice to have a preview of the Parts individually and the entire creation Queue as a whole. Hello! Its possible to add "favorites" list to your very-very-very useful mod? Something like - set up an part of gear/trait/set/armor type, then press "star"-button(add favorites list) and after you klick on this part in fav-list its add one piece to crafting queue. Mail bugs should be fixed in the new version. If you had an issue with just Enchanting, that should also be fixed now. Last edited by Dolgubon : 02/25/19 at 10:52 PM. Get the same error posted below...and the mail never received. This bug will only appear if you do not put a name into the destination field, which is required input. I've added some code to fix it, but as it is a minor bug which doesn't affect functionality, I won't update just for that. I have tried various things to fix this and the only steps that seem to work is opening Minion and deleting this addon along with saved variables. Even when I manually install and uninstall this addon in the ESO addon folder I still get the error. Only by opening Minion and removing it along with the saved variables will fix it. Even then it still usually messes up almost immediately after I log back in. It's just messed up for me and everything I've tried doesn't work. Last edited by warabi : 12/04/18 at 10:08 AM.